In thirty cities across the country, freedom fighters showed us how to live our visions of liberation. 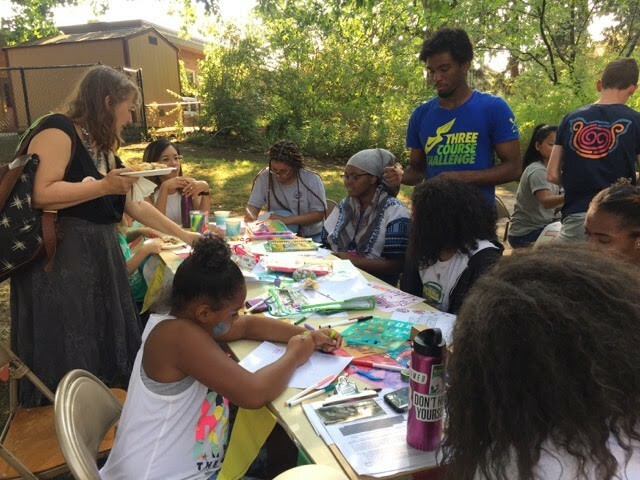 Night Out for Safety and Liberation (NOSL), a community-driven alternative action to the police-centric “National Night Out,” recognizes that safety comes from our communities, not from criminalization. Organizers in Salinas, CA uplift the importance of investing in youth programming over policing. Here we share dispatches from three Night Out for Safety and Liberation events across the country that brought community members together to redefine safety on August 7th. Kanyon Sayers-Roods sang a native song, honoring our grandmothers as the soothing smell of sage filled the air at San Antonio Park. 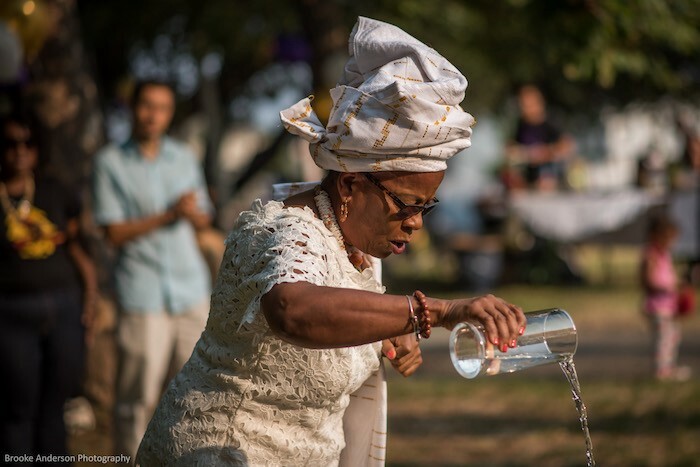 Then she blessed the land during the kick off of the sixth annual Night Out for Safety and Liberation. Everyone in the community of Oaklanders gathered for an evening filled with food, entertainment, music, arts, and above, all a space to redefine what #SafetyIs to our communities. Community members of all ages walked through the pathways of San Antonio Park, making their way towards the pupusas, which were hot off the grill. 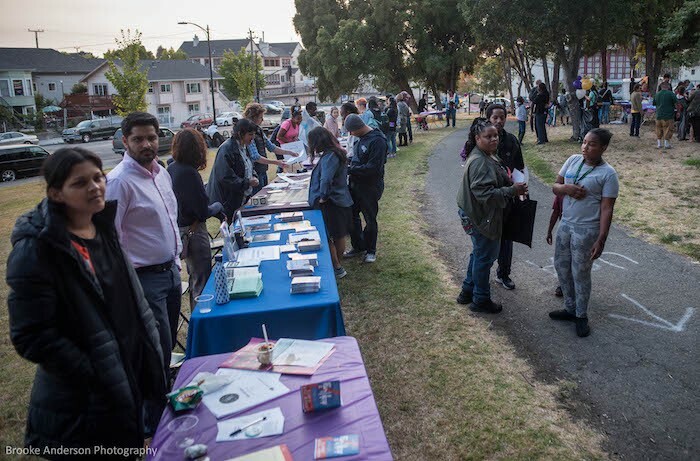 As attendees enjoyed their meals, engaged with one another in conversations, and signed up at community resource tables from numerous Bay Area organizations in attendance. 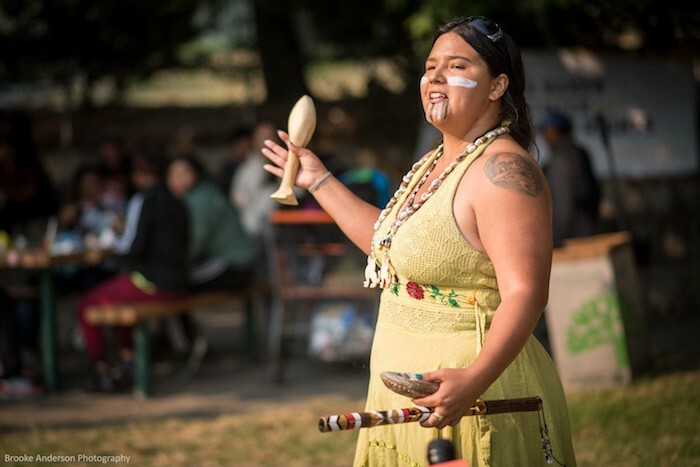 Organizations like The Native American Health Center, provided community members with information on comprehensive services they offer, which improve the overall well-being of American Indians, Alaska Natives, and residents of surrounding communities. The Council on American-Islamic Relations (CAIR), was on-site providing information on their organization’s services of outreach, education, youth empowerment, civic engagement, and legal services. 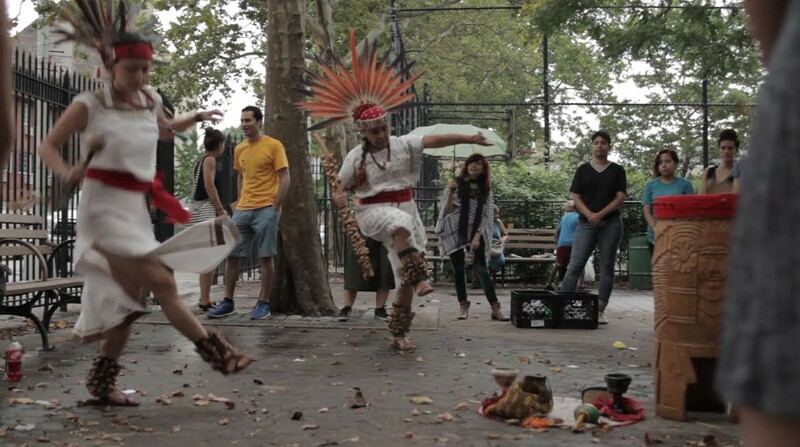 A mixture of vibrant sounds of laughter, music, and overall harmony could be heard from any corner of the park. MC SheBeLadyBlue continued to hype up the already jubilant crowd with more messages of self-determination to preach what #SafetyIs to our communities. As the evening began to conclude, the trees swayed with the soft Bay Area wind to the sound waves from Namorados Da Lua. Afro-Brazilian rhythms transmitted a sensation of soothing vibes and a radiant energy to move along to the music. Members of the crowd clapped along, while some danced freely to the sound of the music. As the sun slowly faded away and the night sky began to appear, the spirit of a collaborative redefinition of what #SafetyIs still shone bright over San Antonio Park. Community members form a circle beneath the trees. 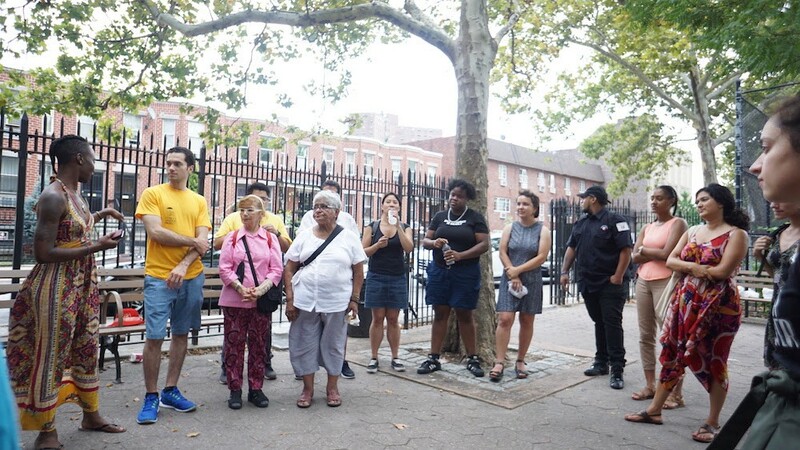 They stand shoulder to shoulder in Chester Park in Brownsville, Brooklyn. Healer Adaku Utah offers them an opening: to give thanks to their ancestors and their bodies for being alive that day. As children ran around trading stickers that stated “#SafetyIs Creating Space to be Ourselves” or “#SafetyIs Education funding,” the adults engaged in reflections on what resiliency practices look like for each of them: whether that’s deep breathing, meditation, making music, or spending time with community. The reminders of how we maintain a sense of self, and how that sense of self gives us the steadiness to take care of each other, offered insight into how we have historically created safety in our communities, and how we must continue to pull on that thread as we build out alternatives to the police. The evening closed with Danza Cetiliztli Nauhcampa sharing ceremonial performances of indigenous dances and songs from Anahuac,grounding community members to their connection to the Earth. While thunderous rain poured down on participants as Danza began their performance, community members stayed grounded in observing the performance, while children danced along. 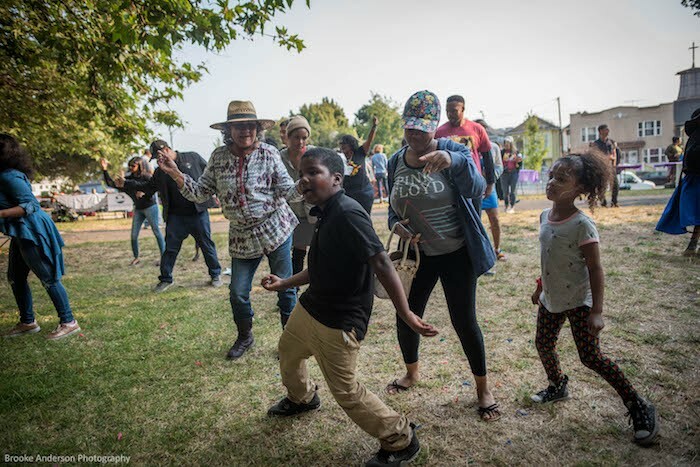 In Portland, 300 people took over Alberta Park to reimagine safety, celebrate Blackness, follow and uplift the leadership of Black and POC youth, and joyfully unite across communities and issues to stand against criminalization and policing. 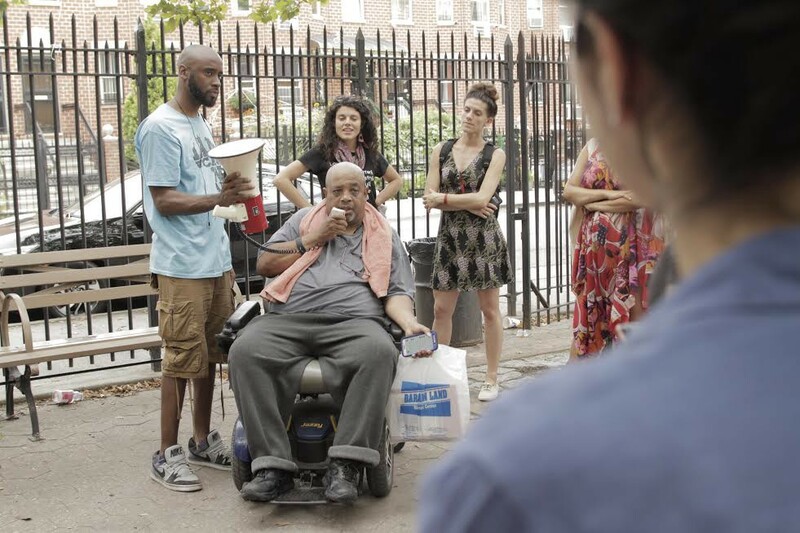 The park was filled with people sharing food, music, art and dialogue, getting arrests and criminal convictions off their records, accessing information on their rights as tenants and as immigrants, learning self-care practices from community healers, creating art projects with children, letter writing to people in prison and listening to incredible Black youth performers from our community. NOSL was led by Umoja Kijana Shujaa, a year-long leadership development program led by Enlace that empowers Black youth to lead while combating white supremacy, criminalization, and anti-Blackness, and advancing Black liberation. “Central to creating safety for all our communities is Black Liberation. None of us will be free until Black people are free. 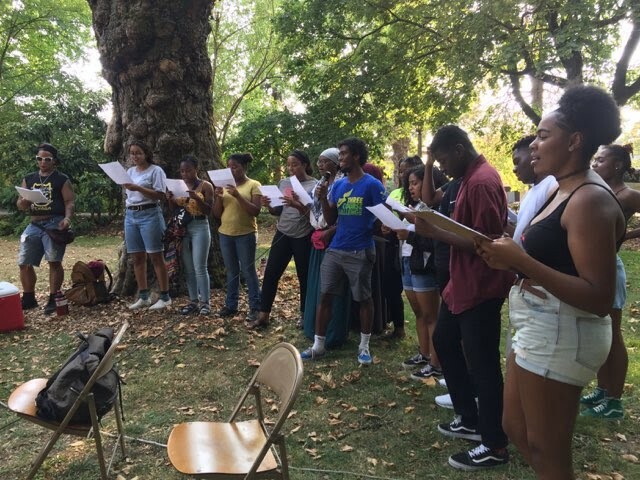 Youth in Umoja Kijana Shujaa have been building on that truth with each other,” said Umoja youth facilitator Denajia Preston before the Umoja cohort led the community in singing the Black national anthem, Lift Every Voice and Sing. The community acknowledged that defining safety must include recognition and respect for indigenous culture, pride and self-determination, our ancestors whose shoulders we stand on, Black pride and liberation, and youth leadership. NOSL brought together Black, environmental justice, tenant, houseless, youth, queer and trans, immigrant and Filipino and international human rights solidarity communities. Together, they created a space that did not exist before, but we built together through compassion, solidarity and understanding.